According to the Centers for Disease Control and Prevention (CDC), the United States recorded 42,249 deaths in the year of 2016 due to opioid overdose, surpassing the amount of deaths caused by breast cancer which is estimated at 41,070 each year. Between July 2016 and September 2017, the amount of deaths by opioid overdose increased by thirty percent. The opioid epidemic is still escalating throughout the nation and has claimed more American lives in 2017 alone than the Vietnam War, which reported 58,220 causalities over the course of twenty years. Although the CDC has yet to officially release the 2017 statistics, the projected amount of deaths by heroin, prescription opioids and fentanyl is said to be close to 70,000 fatalities. The crisis is hard to ignore, especially when it’s happening within our own community. The Washington State Department of Health reports that approximately 3,000 deaths can be credited to drug overdose annually, which is thirty-one percent of all deaths statewide. Snohomish County, namely the Everett-Marysville-Tulalip area, sees perhaps one of the largest amounts of drug-related casualties in the state with around seven hundred deaths per year. 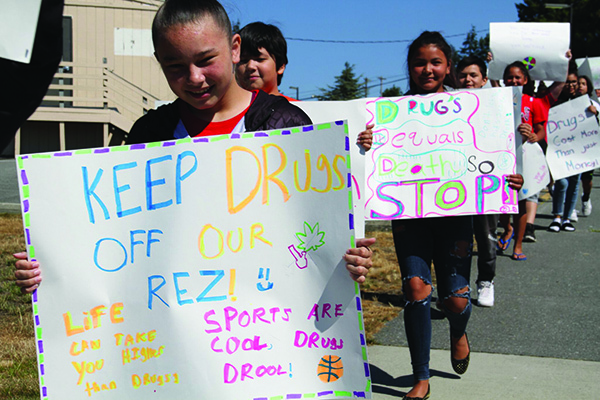 Over recent years, the Tulalip Tribes has fought back strongly against the opioid epidemic, implementing several programs, departments, forums, and events as well as the wellness court system. 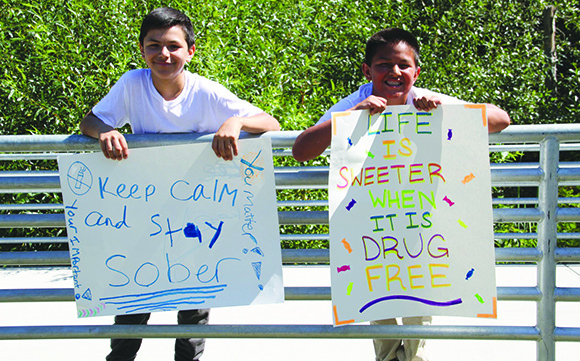 The tribe has been actively dedicated to healing their people who are battling with addiction and continue searching for a solution to the crisis. 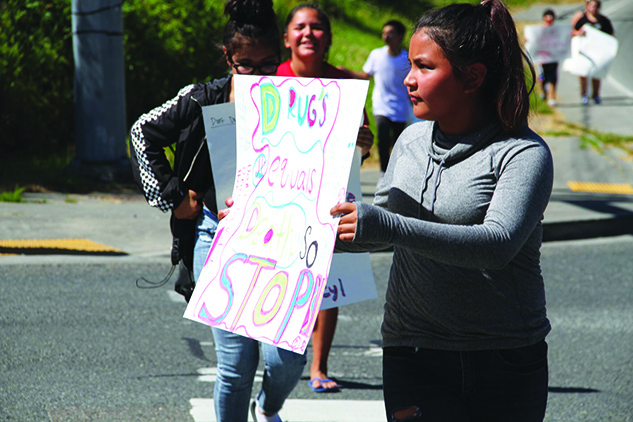 Most recently, during the mid-morning of July 26, the Tulalip 477/TANF department organized a walk against drugs with their Summer Youth Community Service program, comprised of thirty local kids between the ages of eleven and thirteen who wanted to spread awareness for those struggling and help bring an end to drug addiction. The six-week community service program helps kids prepare for the Tulalip Youth Services Summer Youth Employment Program which is open to kids between the age of fourteen and eighteen. Throughout the community service course, the young adults learn about their treaty rights, Tulalip’s history and future, bullying prevention, suicide prevention, drug and alcohol prevention, healthy habits and financial education. The program is currently in its second year and dedicates every Thursday to a community service activity such as beach clean-ups and the prevention walk. 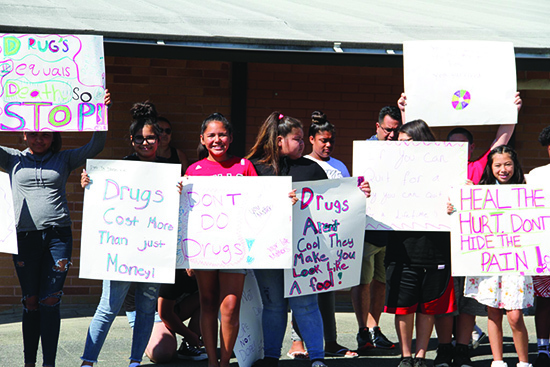 The kids ended the prevention walk at the newly constructed walkway below the Tulalip Admin Building and held their posters up high for passersby to see while on their daily commute. 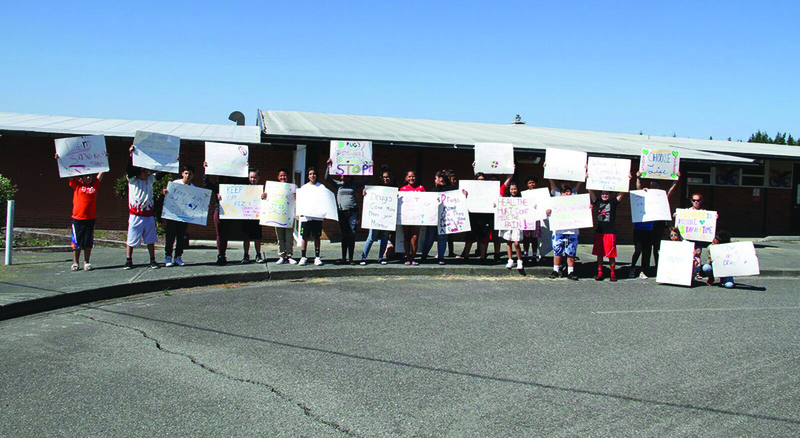 The youth posted up through the lunch hour, waiving their signs and received great response from the tribal employees on their way to appease their appetites. 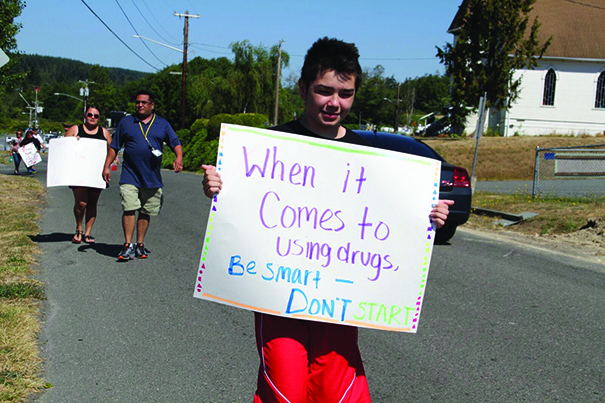 This entry was posted in News, Tulalip News and tagged drug prevention walk, Tulalip, youth by Kim Kalliber. Bookmark the permalink.